Sheikh Mohammed Saleh al-Munajjid has issued a fatwa against building snowmen. Anyone here ever been tempted to worship a snowman? Me neither. Reuters-A prominent Saudi Arabian cleric has whipped up controversy by issuing a religious ruling forbidding the building of snowmen, described them as anti-Islamic. The more imbecilic fatwas issued by these crazed cleric the more people realize that Islam is a joke! 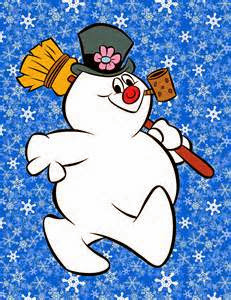 These Saudi Clerics keep getting dumber and dumber..Who doesn't love Frosty the Snowman. I say he needs a few good snow balls thrown at him. Geesh! True Muslims are cold hearted, have no fun in their mind for creation. A child grows by no fun in creation, become when grown up nothing but a terrorist. Muslims are also forbidden to listen music, radio, TV, or even cinema. They are also forbidden to take picture. A true quranic value makes a Muslim heartless creature. All Jihadists are heartless. Only enjoyment they find seeing blood coming out of a slaughter man, and killing people by the name of Allah-Hu-Akbar. Osama Abdallah still defends Islam as code of life and religion of peace. First they went after Mickey Mouse and now Frosty! In Islamic countries they say the cartoon "Pikachu" means "be a Jew"
So I shouldn't make the puppet mohamad, stuffing be inside him?